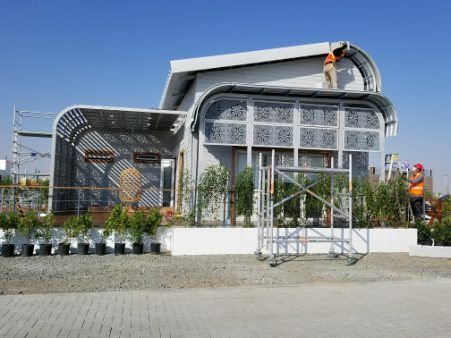 I had the distinct honor of visiting the first-ever Solar Decathlon Middle East last month in Dubai, United Arab Emirates. The Dubai Electricity and Water Authority (DEWA) organized a fantastic event with 15 highly efficient homes designed and built by collegiate teams throughout the Middle East and around the world, including the United States! I met hundreds of students who articulated a deep understanding of building science concepts as well as a commitment to designing structures that meet the unique needs of their intended residents. And, as a result, their talent and dedication led to the construction and presentation of beautiful, creative, and energy-smart living and work spaces. I was captivated by seeing many new approaches developed by student teams from passive cooling, ice or chilled water storage, to flexible design and effective integration of indoor and outdoor spaces. The extent to which teams incorporated water-saving strategies into their projects was truly inspiring–many teams incorporated new methods of filtration and recycled and reused more than 80% of the total water use of the homes. In the desert heat, these homes were cool oases of innovation. They functioned well and inspired visitors, including me, to think differently about our future. A sincere thank you to the DEWA organizers and staff for their gracious hospitality. Congratulations to the grand prize winning team at Virginia Tech and to all the teams on a job well done in designing and constructing truly outstanding buildings! 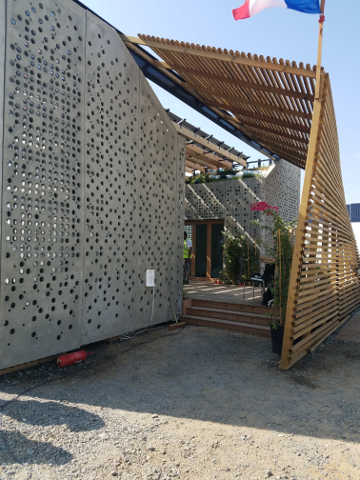 This entry was posted on Friday, December 7th, 2018 at 1:05 pm and is filed under Competition, Events, Solar Decathlon, Solar Decathlon Middle East.